The Northern Lakes Girl Scout Canoe Base is the premier location for girls (over 12) and women to explore the Boundary Waters Canoe Area Wilderness (BWCA) and has provided all-female trips since the 1960s. The base is operated through the Girl Scouts of Minnesota and Wisconsin Lakes and Pines Council. 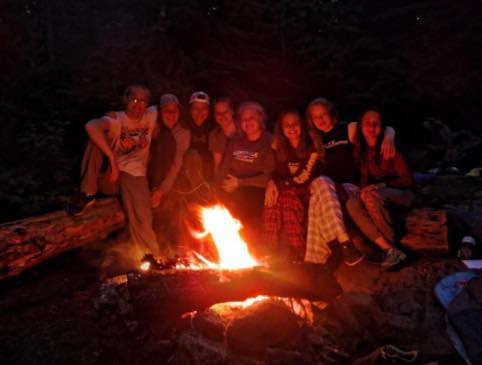 The purpose of the Northern Lakes Canoe Base Alumni Association (NLCBAA) is to provide a continuing interest in, and support for, the mission and programs of the Northern Lakes Canoe Base in keeping with the policies of the Girl Scouts of the USA. The NLCBAA is a non-profit organization made up of past canoe guides along with past participants, community members, and other friends of the base. Our goal is to guarantee that the program we all love continues to inspire new generations of girls by instilling in them a love of nature, a compassion for others, and a sense of self-worth. Summer 2019 Trip Dates are here! Excited for this summer and can’t wait to get planning? Look no further! Our Summer 2019 trip dates are posted, and can be found under the “Plan a Trip” tab on this website. We are excited to offer 7 different sessions, including over 20 different trips in varying length. While all of our trips give the unique opportunity to experience the Boundary Waters Canoe Area Wilderness as a Girl Scout, you can choose the dates that work best for you- from a Canoe Base Sampler Day to an 11 Day Adventure! Coming with a troop or larger group? E-mail Summer Program Director Ann McNally at [email protected] to discuss flexible date options. Are you reminiscing about your days in the woods? Do you miss the great friends you made, the days on the water, and the nights under the stars? Have you been thinking about bringing your family to the magical place which made such an important impact on your life? Well, we have a solution: Come join us for a canoe base reunion next summer! Mark your calendars and reserve the date for the eighth Northern Lakes Canoe Base Alumni Association Reunion from August 9-11, 2019! More details will be finalized and shared with you all in the next few months, but please book your calendars now. Also, start convincing your friends to come and join the festivities! Summer 2018- That’s a Wrap! This year was another great summer at the Girl Scout base, with 100% of our participants reporting they had a great, or very great, adventure. We had 25 girls on NCRnW Session I. This is a big number for us! We had 5 crews enter the Quetico the day their trip started…after being stormbound in the Program Center until almost lunchtime! We played every game we knew, and the GITs dazzled us all with their interpretive reading of a favorite canoe base book, “Here Comes the Girl Scouts.” Katherine Harrell wowed us with an impromptu voyageur lesson which makes me think she may watch that voyageur video even more than she lets on! The crews had great weather the rest of their trip – the council photographer came up and got some great shots of paddle-in day that will certainly be appearing in council publications. All had great stories about life-changing adventures, the magic of the trail and new friends they would keep in touch with, or at least remember, forever. It was awesome. Another highlight — a former NCRnW participant bringing four friends back to the base, from Texas, for a 10-day canoe trip. I was impressed. No parents, and all except for the girl who did the recruiting were first-timers. They did great, of course! We were excited to be invited to share the canoe base story twice in public settings this summer in Ely. In June, Doris and I presented at a Kiwanis breakfast meeting at the Grand Ely Lodge. Many heads nodded in agreement as Doris spoke about the early years, and knew many of the folks she referenced. In July, our neighbors on Leo Lane (the famous house on the cliff) invited us to present at a PEO meeting. PEO is a women’s organization that, as I understand, supports women pursuing higher education. After dessert and tea, we presented our story to about 30 Ely-area women, many of whom also already knew bits and pieces of our story, and a few who had been involved with Girl Scouts over the years. They were especially impressed with guides Caroline and Maddie, who were on base that session and came along to talk about our program today. These types of presentations are so valuable for our program, and something we look forward to every year. In late July, we were approached by Keen shoes about the possibility of renting the property (grounds and showerhouse only) to them to co-host a fall event with the Campaign to Save the Boundary Waters called a “Storycamp.” It was essentially an overnight camping trip sponsored entirely by Keen, where Keen provided the food (very delicious, cooked by chefs they flew in with pots and pans they had shipped to Ely) and attendees paddled into the wilderness in different directions on Saturday (which was a stunningly beautiful fall day) in canoes provided by Piragis (ours were already put away). Find out more at Keen’s article and website. Members can login here, or if you want to become a member, take a moment to register. For more frequent updates, please visit us on Facebook!